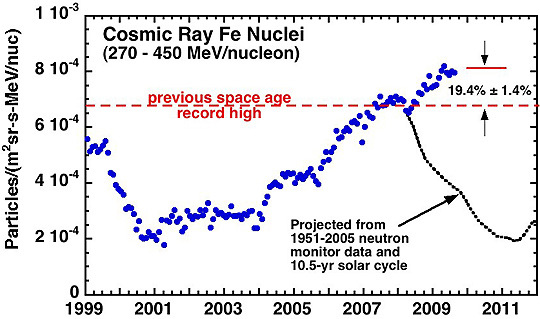 Galactic cosmic ray intensities are 19% higher for all elements. Graphic by Richard Mewaldt, Cal Tech. October 6, 2009 Pasadena, California - In August 1997, a satellite was launched called the Advanced Composition Explorer (ACE) to “study the particles that come near the Earth from our Sun, from space between the planets and from the Milky Way galaxy beyond our solar system.” The ACE satellite is positioned at “L-1,” a site a million miles in front of the Earth with the sun some 92 million miles beyond.